Stock # C00635, 6.7L Power Stroke V8 Turbo Diesel B20 Engine, Automatic, 55857 mi. 2017 Ford F350 DRW Lariat Ultimate 1 Ton Super Crew 4 wheel drive FX4 Long Bed Texas Owner! This Texas beast is powered by a 6.7 liter V8 powerstroke turbo diesel engine, accompanied by an automatic transmission, and patented Ford four wheel drive system with FX4 suspension. Wow!! This is a Texas owner local trade in!! This is a super clean truck! This truck rides and drives fantastic and its fully loaded. This powerful diesel runs strong, the transmission is solid. Besides running fantastic it's good looking too. 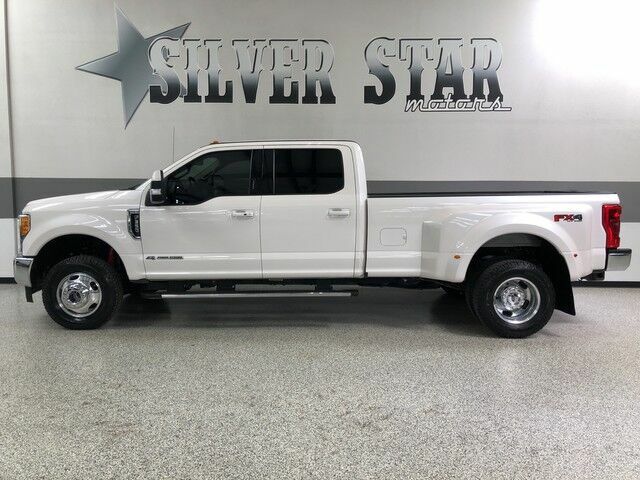 Lariat Ultimate package, FX4 package, Powered Leather seats, heated and cooled seats, power windows, power locks, power tow mirrors, power sliding double moon roof, power sliding rear glass, and power sliding pedals. Premium sound system with GPS navigation, reverse camera, bluetooth wireless and Sync, tow package, ice cold AC, cruise control, tilt wheel, chrome grille, premium 17" alloy wheels with brand new A/T 10 Ply Radar tires, Ford gooseneck/ 5th wheel hitch ready, premium steps, power soft open tailgate, tailgate step, keyless entry with remote start and much much more. Buy this truck with confidence! It's as good as it looks, and it drives like a brand new truck. Plus this truck is Carfax certified, and qualifies for the Carfax buy back guarantee. This is an outstanding vehicle! Buy with confidence and save thousands! As every one of our trucks this one went through our service department and completed our full inspection and service. All the fluids and filters are new and truck is ready to go! Please Call us with any questions. We have financing available, please go to www.texassilverstarmotors.com and click on the financing link, not all vehicles will qualify, depending on year and miles. Ask us about extended warranty's, we have very competitive pricing and great coverage options. We can assist you with reliable shipping to your home or complementary Airport Pick Up at DFW International Airport or Dallas Love Field! Please contact us with any questions. Trey @ 972-637-4234, Rick @ 972-935-5788, William @ 214-674-9221, Blanca @ 972-351-2840, Para Espaol contactar Blanca @ 972-351-2840.